Recently, I went to check out a new Dollar Store in our city. It's called Dollar Tree. I guess it's not really too much different than most dollar stores..except they have Charleston Chew there..YUMMMM!! I'm addicted to that stuff, can't be good! 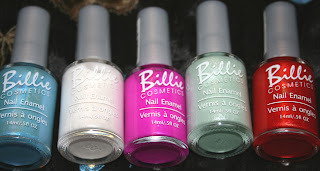 While I was there I found these nail polishes by Billie Cosmetics. It says they are made in the USA. There was quite a bit of colours... perhaps about 20-24. They are 1.25 each and the coverage is quite good for a low end polish. The only ones I wasn't really happy with was the glitter ones when I tested. This pretty irridescent blue, is called "Hot to Trot." This is a white irridescent with sparkles, it's called "Sunray." I don't think I noticed the sparkles that much. This looks a bit brighter than it is, but it's still a very bright purpley pink. It's called Electric Purple and even though it looks irridescent it dries pretty matte. This next one is called "Solar." It's a really pretty mint green with sparkles. Unfortunately, when I tested it with one coat the glitter looked funky..like itty bitty pebbles trapped in my polish. The last one is "Burning Hot." Love that name. It's an irridescent orange. It's got swirls of gold in it. I really like this one and can't wait to try it out a bit more. Have you seen these before? Tried them? What do you think? I love that too! I love a deal! Do you have a Dollar Tree? They are new for us here in Winnipeg. Never heard of them - but I'm always wary of dollar store products in general - so glad to hear these are pretty decent! Heheh, yes they had quite a bit of colours there! I didn't like the ones with sparkle as much. I think there are 2 or 3 Dollar Trees in Winnipeg now. I love these , I have every colour my dollar tree sells. Our dollar tree is new like 2 months and the first time I walked in I purchased them all ;) good quality too ! I picked up 5 neons my last trip! I've been really impressed with the quality of these! :) We've only had our Dollar Tree a couple months as well. Which city do you live in again? wow, I'm surprised since Dollar Tree was in the States long before! I would love to see what else makes this polish so special..do you have any links? I will check the bottle for you! Does the lipstick have lead in it? Have the light lilac purple pearl and I love it! 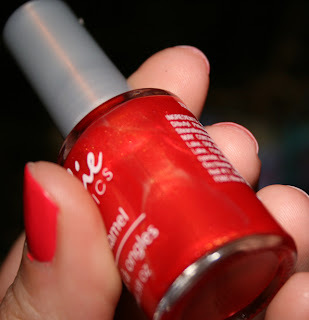 I'm a polish 'connoisseur' and this brand is fantastic for perfect color first coat and goes on beatifully smooth.